Millwall scored an injury-time equaliser just minutes after missing a penalty to dent 10-man Sheffield United's automatic promotion hopes. 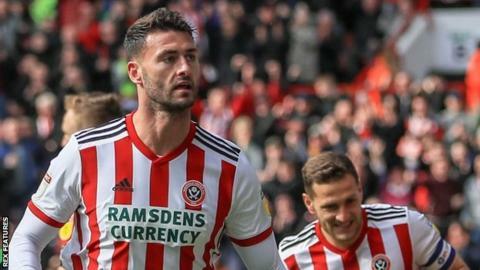 Gary Madine's goal looked like it would be enough to win the game for the Blades before the dramatic finish. With five minutes remaining, John Egan was red-carded for handball but Ben Marshall's penalty hit the bar. Millwall continued to press and a 94th-minute diving header from Jake Cooper earned them a vital late point in their relegation battle. The point temporarily moved United into second in the Championship, but Leeds United's 1-0 win over Sheffield Wednesday saw the Blades drop back into third. Both sides had early chances with the Mark Duffy shooting straight at Millwall keeper David Martin, before Lions captain Alex Pearce spurned an opening from a corner. The home side were then forced into an early change when defender Chris Basham picked-up an injury. Manager Chris Wilder opted for a reorganisation of his formation as he sent on striker Gary Madine as the centre-back's replacement. The Blades were finding Millwall stubborn to break down but began to find some rhythm, with David McGoldrick curling an effort just over the angle. Lions defender Cooper was then called into action with a crucial intervention to divert Enda Stevens' shot behind for a corner. The second-half started as the first ended with the Blades piling on the pressure in search of the opener, which arrived in the 51st minute when John Fleck sent the ball across the box where on-loan Cardiff City striker Madine was waiting to slot home. United also lost top scorer Billy Sharp to injury in the second half, with the 23-goal striker replaced by Martin Cranie. Mahlon Romeo went close with a long-range free-kick for Millwall, but with five minutes of normal time remaining, Egan was shown a straight red for handling a Tom Elliott header on the line. It looked as if the home side would hang on for the points when Marshall struck his penalty against the bar and over, but there was still time for them to level through Cooper's header deep into stoppage time. Despite the result, the Lions dropped one place to 20th and are just two points outside the relegation zone, with five games to play. "As soon as we scored we went backwards. We needed to get the second but everyone thought we had to go safe. I wanted us to play forward but we got deeper and deeper and from a football point of view, we got what we deserved. "We invited pressure. All we needed to do was keep playing the same way we did in the first half. We went safe and I've said to them (the players), if you do that you don't deserve to win games of football; they were there for the taking. "27,000 people see (Ryan) Leonard go through (David) McGoldrick. It's a foul with 30 seconds to go and if he gives it, we get the ball, it's in the corner and we get the win. "The referee should have done his job properly. My reaction was an emotional one as that was an unbelievably poor decision." "I'm delighted with a point and I think we deserved it. I was disappointed with the goal that we conceded, but delighted with the character and belief we showed to get back into the game. "I thought the penalty would be a turning point. We missed it, but we were in the ascendancy. To come to Bramall Lane at this stage of the season and come from behind is a great effort. "What we might lack as a club we won't be let down by desire or spirit within the group. "We have a game in hand which will be vital for us, but any point earned at this stage of the season is hard-earned whether you're at the top or the bottom of the league." Match ends, Sheffield United 1, Millwall 1. Second Half ends, Sheffield United 1, Millwall 1. Jake Cooper (Millwall) is shown the yellow card for excessive celebration. Goal! Sheffield United 1, Millwall 1. Jake Cooper (Millwall) header from the centre of the box to the bottom left corner. Attempt saved. Tom Elliott (Millwall) header from the centre of the box is saved in the top left corner. Assisted by Ben Marshall with a cross. Attempt saved. Jake Cooper (Millwall) right footed shot from the centre of the box is saved in the top left corner. Assisted by Lee Gregory with a headed pass. Foul by David McGoldrick (Sheffield United). Ben Marshall (Millwall) wins a free kick in the defensive half. Hand ball by Tom Elliott (Millwall). Penalty missed! Still Sheffield United 1, Millwall 0. Ben Marshall (Millwall) hits the bar with a right footed shot. John Egan (Sheffield United) is shown the red card. Penalty conceded by John Egan (Sheffield United) with a hand ball in the penalty area. Attempt blocked. Tom Elliott (Millwall) header from the centre of the box is blocked. Assisted by Shane Ferguson with a cross. Attempt saved. Ben Thompson (Millwall) right footed shot from outside the box is saved in the top left corner. Jake Cooper (Millwall) wins a free kick in the defensive half. Substitution, Millwall. Aiden O'Brien replaces Mahlon Romeo. Attempt missed. David McGoldrick (Sheffield United) right footed shot from the right side of the box is close, but misses to the left. Assisted by Oliver Norwood. Attempt missed. Tom Elliott (Millwall) header from the centre of the box is too high. Assisted by Shane Ferguson with a cross following a corner. Corner, Millwall. Conceded by Dean Henderson. Corner, Millwall. Conceded by Jack O'Connell. Attempt saved. Mahlon Romeo (Millwall) right footed shot from outside the box is saved in the bottom left corner. Assisted by Jed Wallace. Gary Madine (Sheffield United) wins a free kick on the left wing. Corner, Sheffield United. Conceded by David Martin. Attempt missed. David McGoldrick (Sheffield United) right footed shot from a difficult angle on the right is close, but misses to the right. Assisted by Oliver Norwood. Jed Wallace (Millwall) wins a free kick on the left wing. Attempt missed. Jed Wallace (Millwall) left footed shot from outside the box is close, but misses the top left corner. Substitution, Sheffield United. Paul Coutts replaces Mark Duffy. Attempt blocked. Ben Marshall (Millwall) right footed shot from long range on the right is blocked. Assisted by Jake Cooper. Substitution, Millwall. Tom Elliott replaces Ryan Tunnicliffe. Attempt saved. Ryan Leonard (Millwall) right footed shot from outside the box is saved in the top centre of the goal. Assisted by Jed Wallace.